His most recent troubles began when his wife Anita discovered that he had married young Cecile Fleming, the daughter of a prominent local businessman. Upon investigation, Anita Best of Los Angeles and Charles Fleming of Santa Ana discovered that Best had married Cecile in back of the county clerk’s office. After returning to Los Angeles long enough to get his belongings, avoiding his mother and his wife Anita, Best and Cecile left for San Francisco, where he was arrested for bigamy. 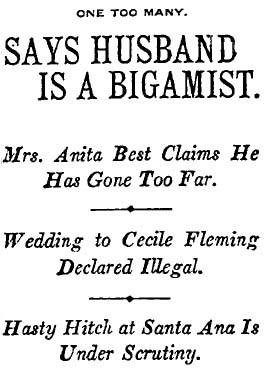 When Best went before the judge, he explained it this way: His wedding to Anita Best was actually invalid because he already had a wife, Bertha, whom he married in 1900. Bertha had died since then, Best said, so his marriage to Cecile was, at least in his mind, legal. “My intentions were honorable, your honor,” Best said. Bertha, however, was found to be quite alive and presumably well-rid of her husband, who was sentenced to a $1 fine and 10 years at San Quentin.